Counting one of England’s best-loved footballers, David Beckham, among its alumni Chase Lane Primary School in East London takes its sporting provision seriously. Earlier this year, David returned to the school to cut the ribbon on a brand new MUGA (Multi Use Games Area) designed and installed by total-play Ltd for use by KS2 children. With the existing KS2 playground deemed too restrictive for ball games, the need for a safe space for ball games during poor weather was apparent. This led the school to embark on a project to transform a section of its extensive green space into a new synthetic sports pitch suitable for a range of disciplines. The contract went to tender with total-play Ltd eventually winning the project through a combination of high quality examples of previous work, a robust yet value-for-money proposal, proven track record and affiliation with ECB. According to Deputy Head Teacher Colin Jeffery, “On all levels total-play Ltd won the contract”. In terms of specification, total-play provided a design that would offer the school an expansive MUGA – at 50m long x 30m wide doubling the usable surface area of the KS2 playground. 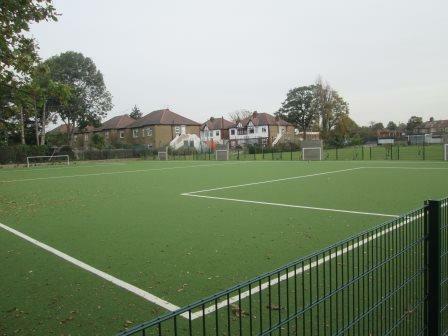 Perimeter fencing with integral football goals were also included within the school’s relatively modest budget. Additionally, to provide a high-quality playing surface suitable for a diverse range of activities, total-play selected a sand-dressed Tiger Turf Evolution Excel carpet. With the specification agreed, materials were delivered to site during October half term 2016; with works commencing in the weeks before Christmas break. total-play’s ability to carry out every aspect of the project using its in-house team alongside its attention to detail in project management was praised by the client, especially as works were carried out in a busy school full of inquisitive children. With the new facility complete, as per the original specification, all spoil from the project was landscaped into the surrounding area; minimising costs for removal and disposal. “The response has been amazing! David Beckham came to open the pitch for us and children absolutely love using the facility. It is used every day by literally hundreds of children. 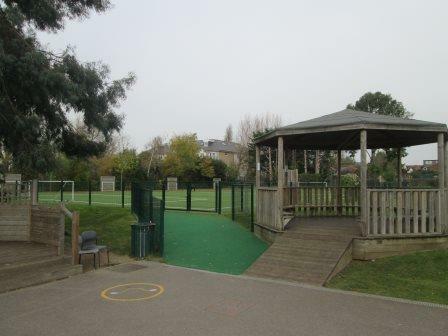 It has had a positive impact on behaviour as children now have space to play freely.